BC is unique in Canada in that virtually no treaties were made in the occupation & settlement of the province. This was in violation of the 1763 Royal Proclamation, which legally bound the British to make treaties surrendering Indigenous territory. Britain –and later Canada– followed this law in their westward expansion, making a series of numbered treaties across the prairies (i.e., Treaty No. 3, etc.). In 1875, shortly after joining Canada, BC passed a Lands Act, meant to open up land to settlement. That year, the federal government issued the 1875 Duty-of-Disallowance, striking down the BC Lands Act and citing the absence of treaties legally surrendering Indigenous title. In response, BC threatened to withdraw from confederation. In 1876, the federal Indian Act was passed, imposing government control over all Indigenous peoples, including those in BC. The province’s illegal occupation of sovereign Indigenous lands was allowed to continue. The 1763 Royal Proclamation was reaffirmed in the 1982 Constitution Act. In 1997, the Supreme court of Canada recognized Aboriginal title in the Delgamuukw case. Despite this, Canada & BC continue to illegally occupy & exploit Indigenous territories. What is the BC Treaty Process? The BC treaty process was first set in motion shortly after the 1990 Oka Crisis. That summer & fall, BC had the most solidarity road & rail blockades with the Mohawks than any other region. In December 1990, the BC Claims Task Force was established. The next year, its report recommended a treaty process and a commission to oversee it, comprised of representatives selected by Canada, BC, and band councils. In 1992, the BC Treaty Commission was established and opened its doors in 1993. The BCTC is based in Vancouver & coordinates treaty negotiations between the three parties, provides funding to the band councils, and works to promote treaties to the general public. As of 2012, over $500 million has been spent on treaty negotiations, with just two treaties being completed (the Tsawwassen and Maa-nulth; the Nisga’a Treaty, completed in 2000, was not a part of the treaty process although it is a model for negotiations). The BC treaty process has several goals: to legitimize the prior theft of Indigenous land; to present the government as fair & honorable for correcting ‘historical injustices’; to provide economic certainty for corporations (i.e., logging, mining, oil & gas, ski resorts, etc. ); and to assimilate Indigenous peoples. The BC Treaty Process is an Attack against Indigenous Sovereignty! Almost all of BC is unceded, non-surrendered Indigenous territory. Aside from the Douglas Treaties on Vancouver Island, and a portion of Treaty No. 8 in the north-east corner of the province, no treaties were made in the colonization of BC. This failure to gain the surrender of Aboriginal title violates the 1763 Royal Proclamation, which required the British to make treaties prior to any trade or settlement in sovereign Indigenous territories. As well, treaties & self-government agreements all recognize the ultimate authority of Canada, its constitution, and its provinces over land & resources. The Treaty Process is based on Extinguishing Aboriginal Title! As part of treaties, band & tribal councils must accept a provision that recognizes these agreements as a full & final settlement of land claims. This legitimizes the prior theft of Indigenous lands & resources, while providing economic certainty for government & corporations. This, in turn, will result in ever-greater corporation invasion & government control of our ancestral territories. The Treaty Process is a Fraud! As agreements between 2 or more sovereign nations, treaties are subject to international law. By involving BC, and by negotiating with band councils (neither of which are nations), the treaty process undermines Indigenous sovereignty and any recourse to international courts or forums. As well, band councils are in a clear conflict of interest in negotiating for land & resources with the same government they receive funding from. Treaties will result in massive Debts! As soon as a band enters the treaty process it receives funding from the government, supposedly for negotiations & research. 80 per cent of this comes as a loan from the federal government. Some bands have received millions of dollars. Already, some $289 million has been incurred as a debt on those bands involved in treaties. These loans must be repaid within 12 years of entering the process. For short-term gain, many band councils are ready to sell-out the future generations while leaving massive debts as their legacy. Treaties will result in Taxation & More Resource Exploitation! As part of plans for band councils to achieve economic self-sufficiency, they will be empowered to impose taxation on their citizens and to play a greater role in resource exploitation & other forms of ‘economic development’. Indebted as a result of treaties, with the financial burden of governance shifted onto them, many bands will feel even greater pressure to exploit their own lands & peoples. Treaties will result in the Loss of any Land Base! Under treaties, reserve & treaty settlement lands become fee simple property, a form of private property than can be bought, sold, leased or seized. This is a direct threat to our last remaining land base: the reserves. Treaties & Self-Government are forms of Assimilation! Since 1876, Canada’s long-term plan of assimilating Indigenous peoples has been based on the Indian Act, which included band councils, reserves, status, and residential schools. Today, the Indian Act, with its special laws & status for Indigenous people & reserves, is seen as an obstacle to assimilation. One of the purposes of treaties & self-government agreements is to remove bands & reserves from the Indian Act, resulting in their legal & political assimilation into Canada. Our people must be informed & made aware of the dangers of modern-day treaties & self-government agreements. To educate & raise awareness, public forums can be organized within communities directly affected by treaties & self-government agreements. In addition, we can begin to regain control of our territories & resources through more active use of our land & traditional culture. Through education & organization, we can mobilize our people to refuse treaties & self-government agreements that threaten our territories & way of life. Indian Act chiefs & councilors can be pressured to reject government policies of assimilation & genocide. 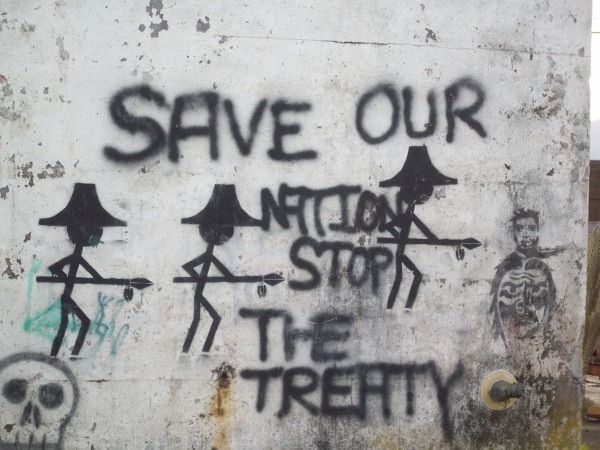 Posted on March 29, 2012, in Colonization, Documents and tagged anti-treaty, bc colonial history, BC treaty process. Bookmark the permalink. 5 Comments. Repeal the existing Indian Act : The existing Indian Act was drafted in 1876 by the Canadian Government with guidence from the Catholic and United Churchs. The idea resulted from the Vadican in Rome in 1845. A complete repeal of the act with direct input from Indians assisted by lawyers or university educated people would be my suggestion. Indians like myself who were registered from the Bill C-31 legislation who are left landless should have benifits such as access to reservation land. The purpose of the Indian Act was, and is, to assimilate Native peoples into European society. It was always intended as a temporary set of laws to be removed once it was deemed that Natives were more or less successfully integrated into the system. Since the 1970 ‘white paper’ that advocated repealing the Indian Act and abolishing the reservations the goal of the Canadian state has been to remove all special legal status of Natives and reserve lands. The treaty process in BC is one method they are using to do this. Lawyers and university educated Natives would only help the state achieve its goal. Better to work for the liberation of Indigenous peoples and lands while protecting what little land base remains. As a Maa nulth member and victim of treaty. Stop the process!! Please. Heed Warning. All BC first nations stop!! Treaty is for corrupt politicians and corrupt business men. What happened to all the lovey dovey treaty propaganda maa nulth spewed for years? Its gone. the people got fooled, lied to , manipulated, scammed, etc. Chief Ed John is now Chair of the UN Permanent Forum on Indigenous Issues. It is important that people know ‘Fast Eddy’s background as one of Canada’s foremost collaborator princes, so that they will not be taken in by him on the international scene. Are there any decent articles, or can this site do something on this guy’s role in Canadian/BC’s neo-colonialism?